Bookmarked! Can't wait to use it for the Heart of Maguuma Gatherer dailies since my guild has moved into Windswept Haven. Lion's Arch, near the end of the "Troll's Revenge", easily accessible with mounts. Southsun Cove, there's a lot of passion fruit near the Wurm Area. That's handy, thanks for sharing! Thank you for the nice link. I am the lucky soul in our guild tasked with writing the daily motd, which includes the "fastest three daily quests." I try to use gatherer everytime, but one thing in particular drove me crazy the last weeks: Desert Miner! Kryta Forager: START at Cereboth Waypoint (Kessex Hills) and heading south-east to the Isgarren's View POI. A field of starwberry plants. Desert Forager: START at Temple of Kormir Waypoint (Crystal Oasis) and heading north, jumping into the canyon. While the area is hostile with hydras arround, it has plenty of plants to gather. 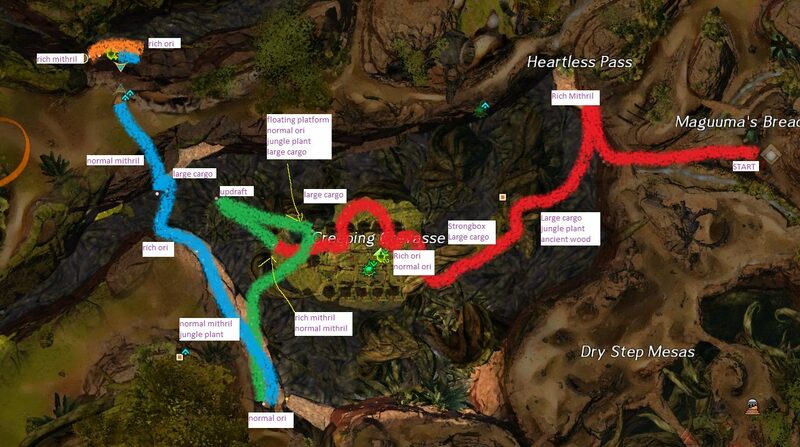 Desert Forager: START at Destiny's Gourge Waypoint (Crystal Oasis) following the river inside the canyon from south to north. Ascalon Lumber: START at Apostate Waypoint (Fireheart Rise) heading west/northwest. This spot not always works! Shiverpeaks Lumber: START at Gyre Rapids Waypoint (Timberline Falls) walking north/south. Shiverpeaks Lumber: START at Gentle River Waypoint (Timberline Falls) walking arround the area. This spot not always works! Maguuma Jungle Lumber: START at Akk Wildlands Waypoint (Metrica Province) heading north. Maguuma Wastes Lumber: The area near Blue Oasis (Silver Wastes) and east of it. There is a skritt tunnel leading there directly from Camp Resolve (iirc). Desert Lumber: START at Highjump Ranch Waypoint (Desert Highlands) walking arround the area in a bigger circle. Fast done with a raptor/rabbit. Kryta Vista: START at Beetletun Waypoint (Queensdale) simply walking south. This can be done with closed eyes ^^. Orr Vista: START at Fort Trinity Waypoint (Straits of Devastation) heading west to the airship. No difficult jumps or hostile area. Maguuma Jungle Vista: START at Caledon Haven Waypoint (Caledon Forest) heading inside the haven, up the ramps and you are at the vista. Ascalon Miner: START at Sanctum Waypoint (Diessa Plateau) heading east into the canyon. There are always plenty of nodes. Maguuma Jungle Miner: START at Gallowfields Waypoint (Brisban Wildlands) heading south into the Crescent Moon Canyon :P.
Maguuma Wastes Miner: START at Hidden Depths Waypoint (Silverwastes) return to the surface and head north. There usually is a rich mithril vein close by and another orichalcum vein or mithril vein a few steps away. START at Augury's Shadow Waypoint (Elon Riverlands) and head east to the Heart. You do the regular nodes you can find and also stirke at the Brand Battleshards. Upon destruction these become gathering nodes which count towards the daily. The obtained quest-items can be exchanged that the charr at the waypoint for karma. It is not a perfect way, but it works. I know I am missing a few Heart of Maguuma ones. We have our guildhall in AB, so we do the lumber/minder/gatherer with our guildhall nodes. @ReaverKane.7598 Thanks for your suggestions! I'll have a look at them and add whatever's missing when I have the chance. @HnRkLnXqZ.1870 Thank you for sharing your suggested locations, I'll add them whenever I can! I made the choice of limiting to only 2 locations per "daily" at the start, just to have a goal and finally be able to release something. So I'll continue adding locations, thank you again for sharing your locations! EDIT: I've added some locations for the Desert Area among other locations now. Remember to CTRL + F5 the site to see the latest updates! if you want you can share this useful information also on Guild Wars 2 reddit, there are many many people reading it everyday. Let me know if you find any bugs, and I'll do my best to fix it. I'm still working on getting through all the suggested locations. If you've started the quest chain to obtain the griffon, you can use the gizmo it gives you to teleport to the Sunspear Sanctuary. Right at the bottom of the cliff under that load in location is a rich mithril vein. That alone completes the daily. Minidungeons have now been added as well! I still lack the pictures for some of them, but everything else is added! And I'll add the pictures as soon as possible! 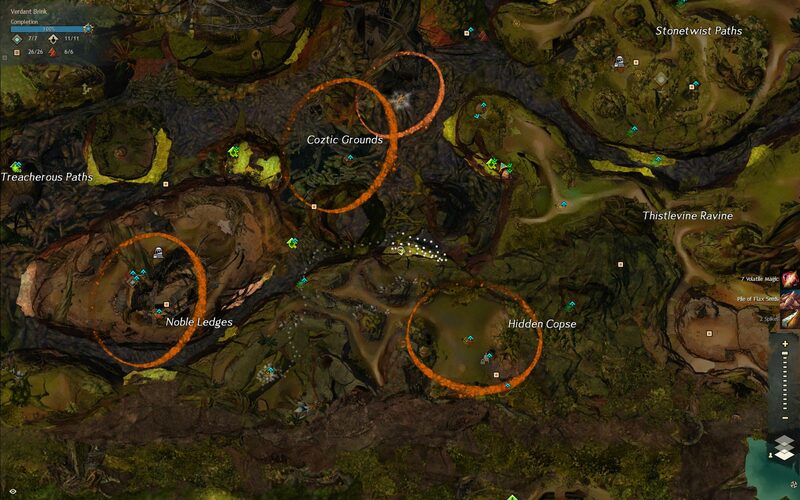 I also added new maguuma wastes mining locations. Thank you for the awesome website! It is really helpful. Lovely resource! Thank you for sharing- I bookmarked it for later use! Thanks! I did finally find my lumber, however. Thank you everyone for your kind feedback! I'm glad you all find the site helpful! Love it. You did a great job. I've got it bookmarked! Very handy! Been using it the past few days. FYI, I am mot seeing today's Rich Orichalcum Vein near Faren's Flyer waypoint. I also don't see a way on your page to report discrepancies. This specific location is a tricky one, because just as the mining ones in Maguuma Wastes, they have several places that they rotate between. Ah that is tricky. Don't know if you could implement a thing where it presents all the locations that rotate, and once a few players confirm which one is there today, it just shows that one. If it rotates during the day rather than from day to day, of course, that won't be possible. I think it's dependent on the particular copy of the map you're in rather than player-to-player, day-to-day, or hour-to-hour. It is indeed per instance. I can think of 5 other spawn points for that rich ori. 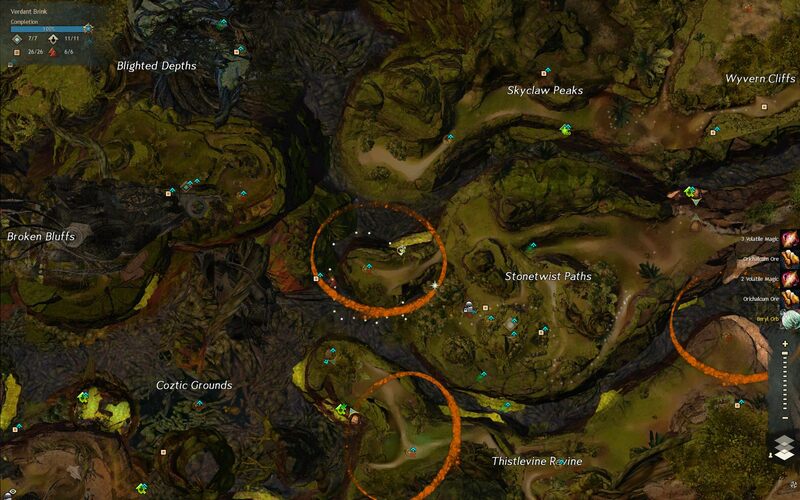 For the location shown there is also a rich mithril spawn point nearby which is under the frog HP. Ah, I was mistaken about how it rotates then, thanks for clarifying! I will have to take a look at the different locations where they spawn and see if I can add them in near future. Obviously not all the nodes will be there at the same time and there are some missing normal mithril nodes but statistically you should have it done by the time you go through that route with 6 possible rich metal nodes spawns as well as some normal nodes. Added new forager location in Kryta, thanks to Flavour who gave me the tip by joining our Discord!